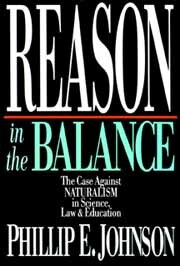 In Reason in the Balance, law professor Phillip Johnson continues his Darwin on Trial style as he disrupts the evolutionary establishment now exposing naturalism as the "established religious philosophy" of our day. According to naturalism, God has no place in law, science, or the schools. Naturalistic thinking rules the intellectual world, including the public government schools, the universities, and the elite of the legal profession. But is naturalism itself beyond question? Few among the cultural elite have dared doubt it. Now comes Phillip Johnson, Berkeley law professor and former clerk to the U.S. Supreme Court, set to take on the "intellectual superstitions" of the day. After this book, the culture wars may never be the same again. This page was last modified on 9 January 2007, at 19:01.